To state the obvious, it has been bitterly cold throughout a majority of the United States this week. Roughly 180 million Americans are experiencing sub-freezing temperatures, Niagara Falls is frozen over, and Tallahassee, Fla., could get its first measurable snowfall since 1989. New Year’s Day 2018 marked the coldest day in the 21st Century, and as a result the U.S. record for natural gas consumption was obliterated. But ironically, throughout much of the Northeast — where an abundant supply of natural gas is in close proximity — “Keep It in the Ground” movement-driven blocks and delays on natural gas pipeline projects have resulted in grid operators turning to higher-emitting fuel sources to meet the extreme demands in the region. Natural gas prices are also skyrocketing in the Northeast while remaining low and stable elsewhere in the country, particularly in areas where infrastructure has kept up with demand. America has been in a bit of a freeze since Christmas. This, coupled with natural gas holding down the top spot for U.S. electric generation since 2016 and residential natural gas use (heating, cooking, etc.) accounting for 16 percent of total U.S. natural gas consumption in 2016, it’s no surprise that record temperatures led to record natural gas consumption. According to Bloomberg, from Dec. 22 to Dec. 26, total natural gas consumption increased by 31 percent, with Americans using 115.7 billion cubic feet (bcf) of natural gas the day after Christmas and setting a new record for this time of year. 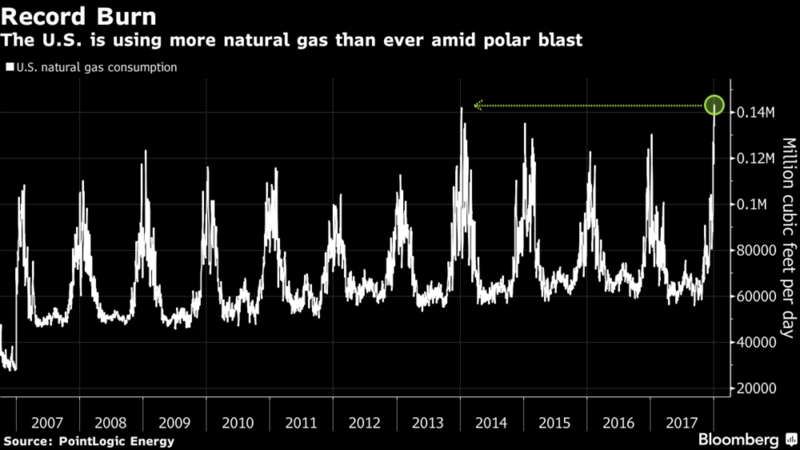 Then on New Year’s Day, the U.S. shattered that high, and a previous overall record set in 2014, when Americans consumed 143 bcf of natural gas, as the following chart from Bloomberg shows. 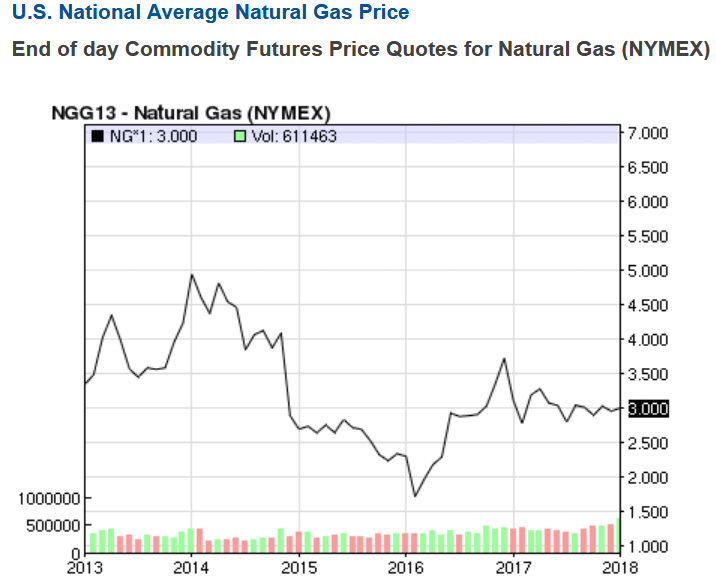 But here’s the thing – unlike in 2014 when extreme temperatures led to the price of natural gas doubling to roughly $8 per a million British Thermal Units (mmbtu), prices have remained pretty constant around $3/mmbtu across much of the country as the following chart shows. Unfortunately, that’s not the case everywhere. Despite the abundance of natural gas in the Northeast thanks to the Marcellus and Utica shales, the region – particularly New York and New England – is experiencing some of the highest natural gas and electricity prices in the country. 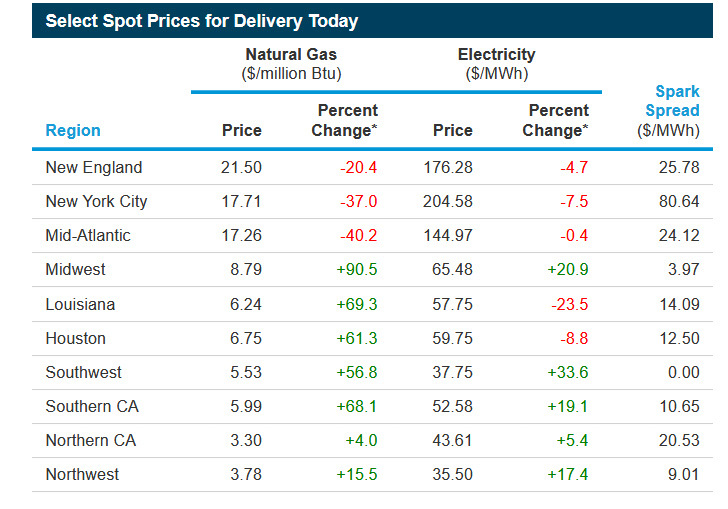 In fact, New England had the highest price for natural gas in the world at the end of December ($35.35/mmbtu). But how does a region that sits next door to (and in some cases, on top of) one of the largest supplies of natural gas in the world find itself with a shortage of the resource – and paying top dollar for it? New York and New England aren’t quite grasping the whole “if you build it, they will come” concept. Another Forbes contributor, David Blackmon, described an additional factor in the obstruction of new infrastructure being built to service New York and New England: New York Governor Andrew Cuomo. “As if it weren’t bad enough that Cuomo’s actions are denying thousands of New York residents the right to exercise their property rights and causing the state’s residents to pay higher prices for home heating and electricity, Cuomo’s obstruction costs New Englanders as well. Katherine Eiseman, activist and president of the Massachusetts Pipeline Awareness Network – a group that has worked alongside groups like No Fracked Gas in Mass to prevent natural gas infrastructure from being used in the Northeast and promote the use of more renewable energy – rightly told MassLive.com, “Despite the cold, power plants have had no problem providing reliable power to New England.” That’s a testament to the preparedness of the market suppliers and power plants, for sure. Further, this isn’t a temporary issue. As Dodge noted, the Northeast consistently has some of the highest electricity prices in the country, and the recent cold weather is just a shining example of the issue. To go back to the Energy Information Administration (EIA) daily price chart from Jan. 2, New Englanders and New Yorkers are still paying the highest costs for natural gas and electricity in the country, and that’s directly related to a lack of natural gas supply that could be alleviated with increased pipeline capacity. Further, while there is an argument to be made for the importance of every energy source, it is a fact that the conversion to natural gas-fired power generation is reducing U.S. greenhouse gas emissions. ISO New England (ISONE) and New York ISO (NYISO) are still using a hefty amount of natural gas, 23 percent and 16.3 percent, respectively, as of Wednesday evening, and aren’t having “widespread blackouts” as Eiseman noted. But in order to keep up with the increased demand that such cold temperatures are causing, both ISONE and NYISO have had to switch to higher emitting fuel sources that activists pushing for more renewables might find less than satisfactory. And that’s exactly what’s happening. As Wald noted in her Forbes piece, ISONE is now using petroleum (oil) to meet its increased electricity demands. 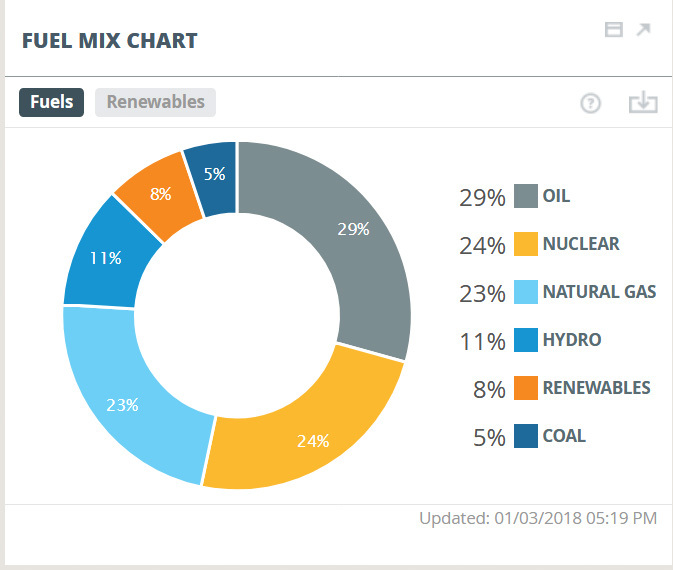 As can be seen in the following real-time chart from ISONE, at least on Jan. 3, that percentage of oil use has actually increased with the resource currently the number one fuel source for electric generation in New England. NYISO does not break its dual fuel generation down further, but it can be coal, oil or natural gas. 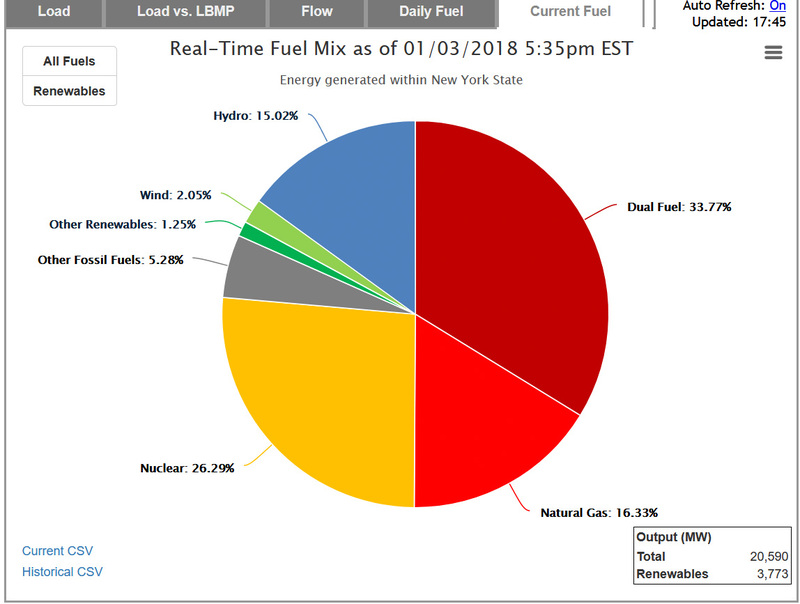 Regardless, as the following real-time NYISO chart shows, New York’s energy generation is currently 55.4 percent fossil fuels. What’s more is that while nuclear currently accounts for more than a quarter of New York’s energy generation mix, NYISO has determined that the Indian Point nuclear facility that has been slated for retirement can close without impacting system reliability based on planned projects that include three natural gas or natural gas dual fuel facilities already under construction. In other words, natural gas and other fossil fuels will continue to play an important role in the state’s energy mix, even with Governor Cuomo’s aggressive renewable plan and obstruction of necessary pipeline infrastructure. The bottom line is that most of the country is riding out this cold wave without increased costs thanks to an abundance of natural gas. Yet those states closest to one of the largest sources are experiencing pipeline capacity constraints that are causing unnecessary higher costs for the region and grid operators to look to alternate fuel sources to make up electricity deficits.